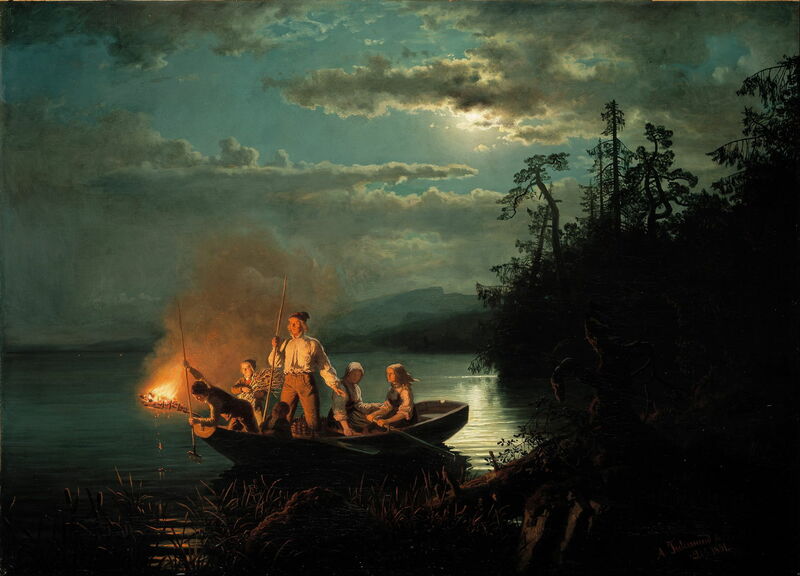 Adolph Tidemand (1814–1876) & Hans Gude (1825–1903), Lystring på Krøderen (Fishing with a Harpoon) (1851), oil on canvas, 115 × 159 cm, Nasjonalgalleriet, Oslo. Wikimedia Commons. The Pre-Raphaelite landscape painters were by no means the only artists in the mid-nineteenth century who placed high value on detailed realism and painting true to nature. These were as important to several of the great American landscape painters, and in northern Europe, where perhaps one of the greatest exponents was the Norwegian artist Hans Gude (1825–1903). Born and initially educated in Christiania (now Oslo, Norway), Gude started to study at the Academy of Art in Düsseldorf, Germany, in 1842. There he joined a recently-formed landscape class taught by Professor Johann Wilhelm Schirmer. Gude rejected the conventional teaching that landscape paintings should be composed according to classical or aesthetic principles, preferring instead to paint thoroughly realistically, and true to nature. On completion of his studies (probably in about 1846), Gude returned to Norway. Hans Gude (1825–1903), Landscape Study from Vågå (1846), oil on canvas mounted on fibreboard, 28.5 x 42.5 cm, Nasjonalgalleriet, Oslo. Wikimedia Commons. 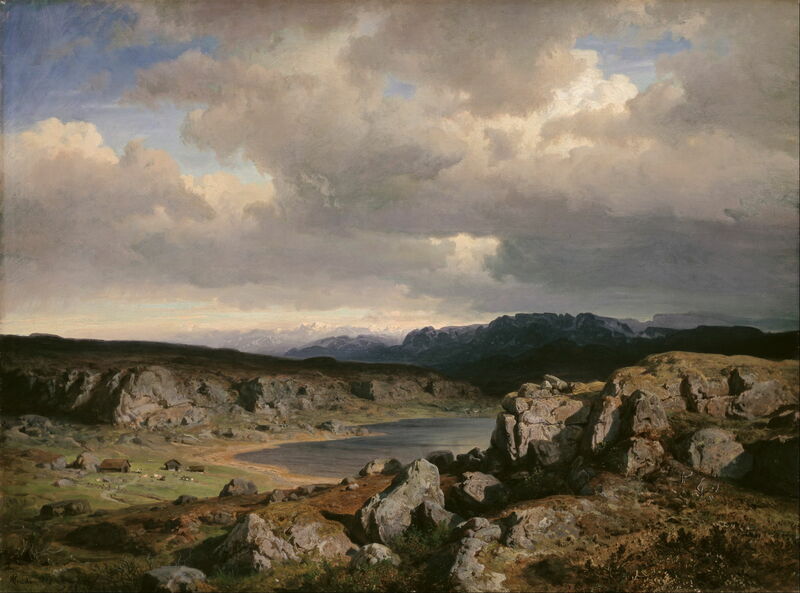 Landscape Study from Vågå (1846) is an excellent example of one of his early oil studies, and was probably completed in front of the motif, in Norway’s mountainous Oppland county north of the Jotunheimen Mountains. Although its background is very loose and vague, foreground detail is meticulous for a work which appears to have been painted en plein air. His depiction of lichens, mosses, fungi and plants is comparable to that of the best Pre-Raphaelites, although at this time the only manifesto advocating such an approach was the first volume of John Ruskin’s Modern Painters, published in 1843. I think it most unlikely that Gude would have read or been influenced by Ruskin at this time. Hans Gude (1825–1903), Vinterettermiddag (Winter Afternoon) (1847), oil on canvas, 50.5 × 36 cm, Private collection. Wikimedia Commons. 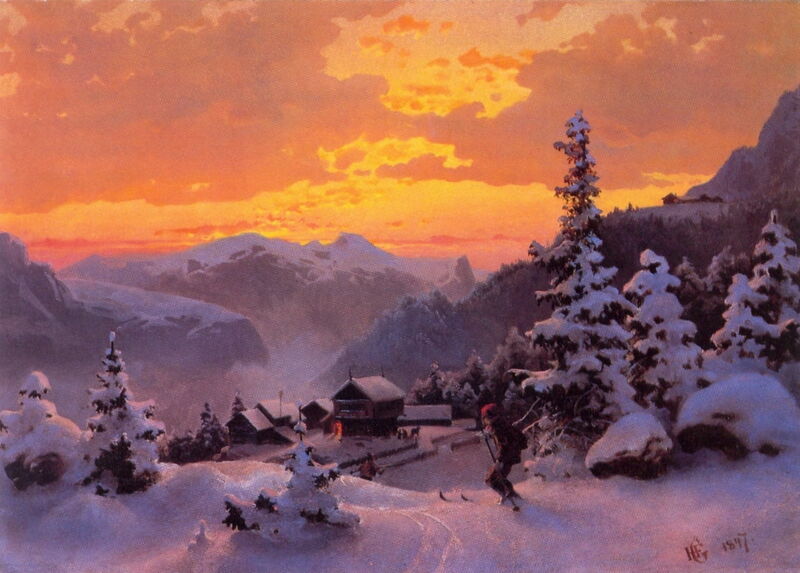 Vinterettermiddag (Winter Afternoon) (1847) is a studio painting which would not look out of place on a greetings card, and a stark contrast. 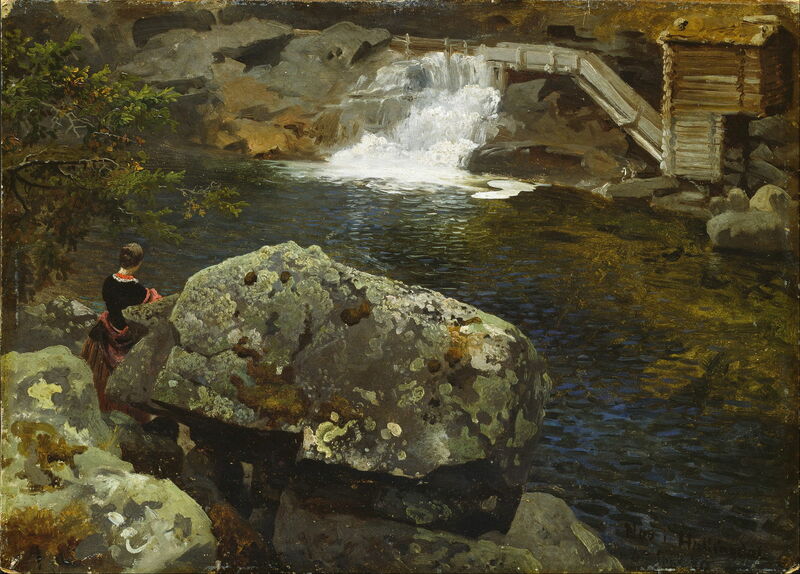 Hans Gude (1825–1903), Tessefossen i Vågå i middagsbelysning (Tessefossen in Vågå at midday) (1848), oil on canvas, 119 x 109 cm, Private collection. Wikimedia Commons. 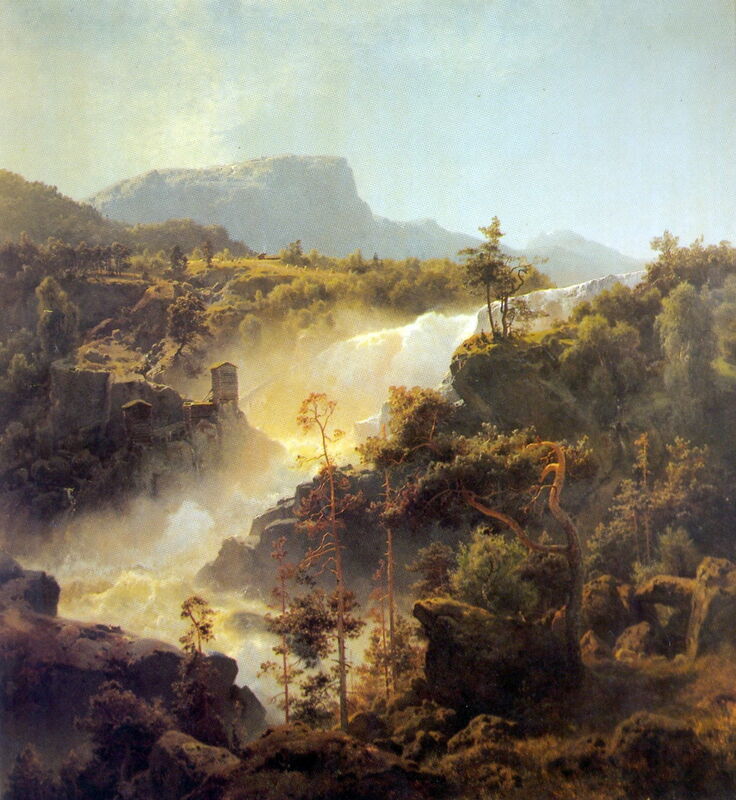 Tessefossen i Vågå i middagsbelysning (Tessefossen in Vågå at midday) (1848) is a relatively large studio painting which might seem more typical of an American landscape painter of the day. Early in his career, Gude struggled to paint realistic figures, and in several works he enlisted the help of Adolph Tidemand to paint those in for him. 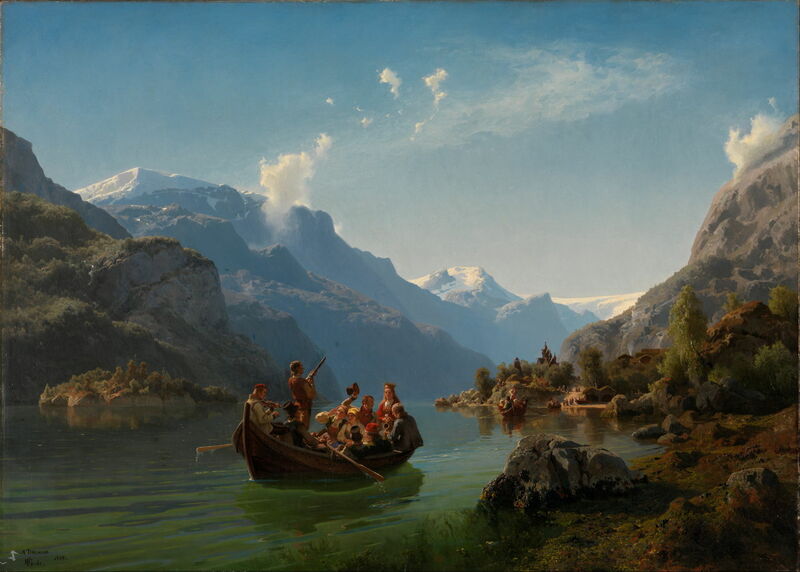 Among the results of this collaboration are some of his most spectacular works, such as Brudeferden i Hardanger (Bridal journey in Hardanger) (1848). Gude’s highly detailed and realistic landscape is set in the far south-west of Norway, in the region to the east of Bergen, where one of the world’s largest and most spectacular fjords carves its way from glacier to the sea. 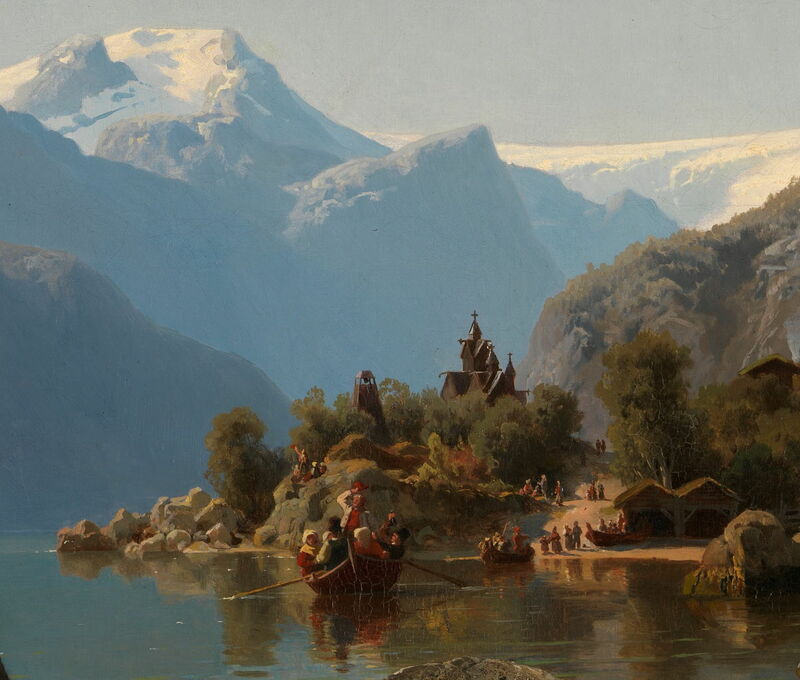 Adolph Tidemand (1814–1876) & Hans Gude (1825–1903), Brudeferden i Hardanger (Bridal journey in Hardanger) (detail) (1848), oil on canvas, 93 × 130 cm, Nasjonalgalleriet, Oslo. Wikimedia Commons. Not a particularly large canvas, it is as meticulously detailed as might have been expected from a Pre-Raphaelite, although its colours are not quite as brash. Gude became particularly interested in reflections on water later in his career. Hans Gude (1825–1903), By the Mill Pond (1850), oil on paper mounted on cardboard, 34 x 47 cm, Nasjonalgalleriet, Oslo. Wikimedia Commons. By the Mill Pond (1850) seems to have been another plein air study, but is so detailed that it would be hard to class it as a sketch. When looked at more carefully, though, many of its apparently precise passages turn out to consist of very gestural marks, as in the lichens on the boulders in the foreground, and the small waterfall at the back. It is also interesting in containing a figure, which may perhaps be Betsy Anker, who Gude married in the summer of 1850. This later collaboration with Tidemand, Lystring på Krøderen (Fishing with a Harpoon) (1851), is a wonderful nocturne showing night fishing in sheltered waters, and another masterpiece of detailed realism. In 1854, Gude was appointed professor in succession to his former teacher Schirmer, which was remarkable recognition for the Norwegian who was not yet thirty years old. He tendered his resignation in 1857, but did not actually leave Düsseldorf for a further five years. Hans Gude (1825–1903), Norwegian Highlands (1857), oil on canvas, 79 x 106 cm, Nasjonalgalleriet, Oslo. Wikimedia Commons. 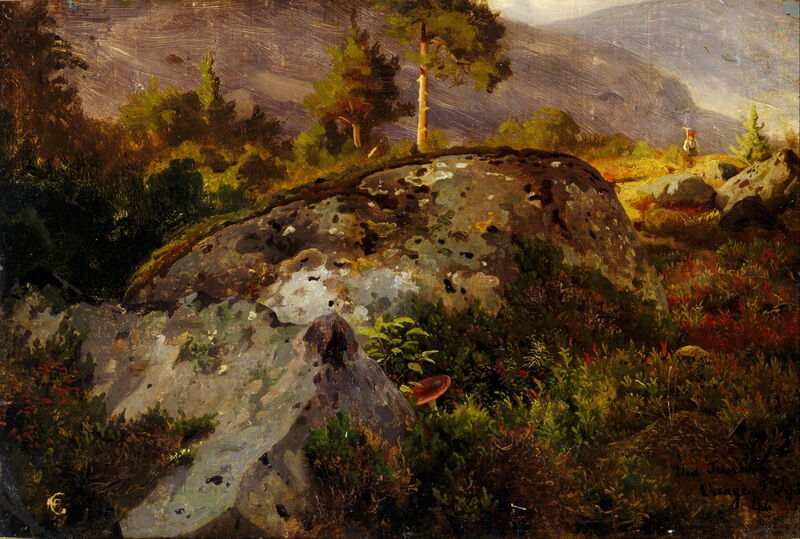 In its composition and foreground detail, Norwegian Highlands (1857) conforms to Ruskin’s precepts, although it was painted in the studio from plein air studies and retains more traditional earth-based colours. During the 1850s his paintings had aroused some interest in the UK, so in 1862 Gude travelled to Wales to try to develop his British market. Hans Gude (1825–1903), Efoy (?) 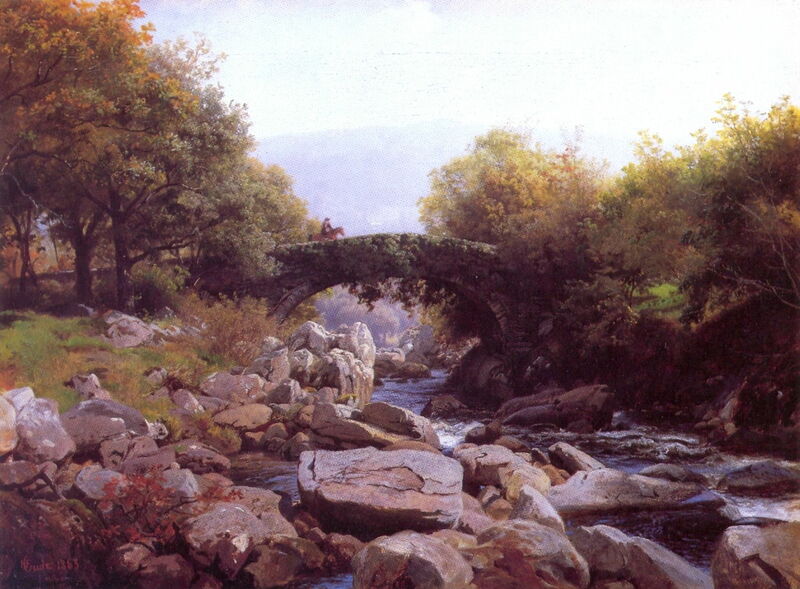 Bridge, North Wales (1863), oil on canvas, 41.5 × 55.5 cm, Nasjonalgalleriet, Oslo. Wikimedia Commons. 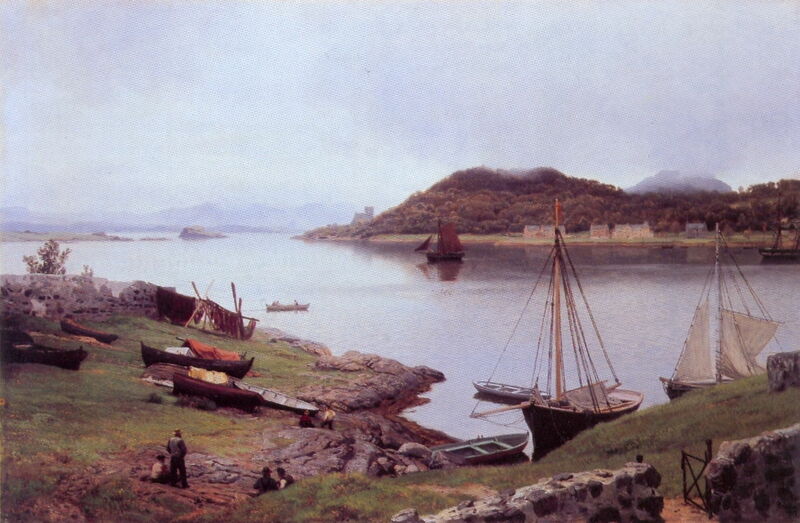 This painting of what he called ‘Eføybroen’, which might be an ‘Efoy’ Bridge, in North Wales was completed in 1863 from studies made of the motif in the previous autumn. Hans Gude (1825–1903), The Lledr Valley in Wales (1864), oil on canvas, 63 x 98 cm, Nationalmuseum, Stockholm. Wikimedia Commons. 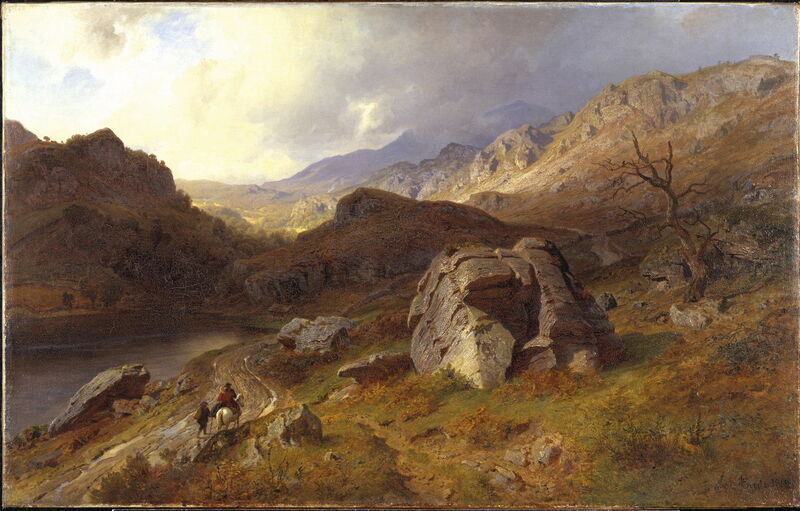 He also painted some grander landscapes of The Lledr Valley in Wales (1864), where he stayed during this campaign, which conform more to Ruskin’s precepts. Gude continued to work by painting studies en plein air, which he took back to the studio and worked up into a finished painting there. In contrast, local British painters at the time tended to complete their finished works in front of the motif, and seldom painted landscapes in the studio. When Gude’s paintings were exhibited at the Royal Academy in 1863 and 1864, they achieved little recognition, and failed to sell. At the end of 1863, Gude was offered the post of professor at the Baden School of Art in Karlsruhe, which he accepted (there still being no academy of fine art in Norway). During his tenure there, many Norwegians were students; some of the best-known include Kitty Kielland, Eilif Peterssen, Christian Krogh, and Frits Thaulow. Hans Gude (1825–1903), Fjord Landscape with People (1875), oil on canvas, 36 × 56 cm, Private collection. Wikimedia Commons. While he was teaching in Karlsruhe, Gude continued to promote the practice of painting en plein air, and his figures steadily improved. Fjord Landscape with People (1875) shows a typical period scene, with figures, cattle, horses, sailing vessels, and another of his wide open views. 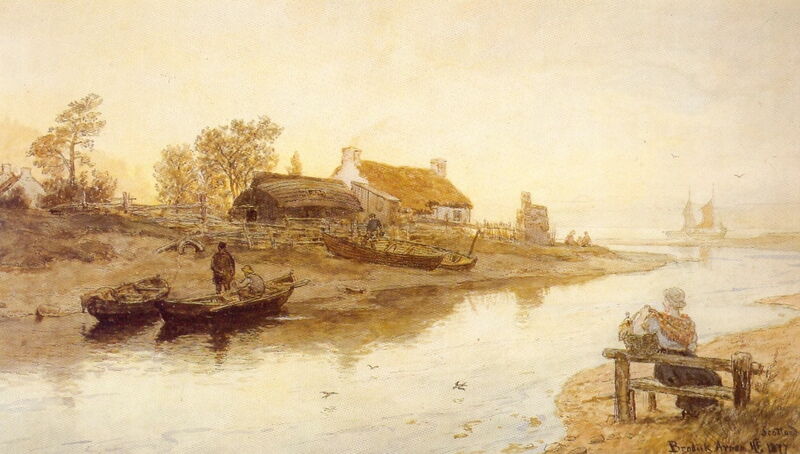 Gude also worked in watercolours, and during his later career visited Scotland on several occasions, where he painted this almost monochrome view of an Estuary at Brodick, Arran, Scotland (1877). 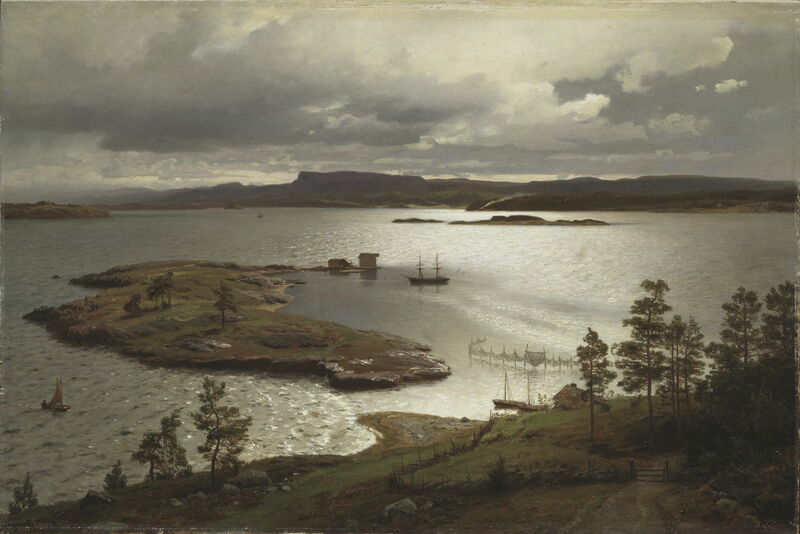 Sandvik Fjord (1879) is a startlingly detailed depiction of a view from above Sandviken, now the northern suburbs of the Norwegian city of Bergen, looking to the west and the island of Askøy. In 1880, Gude moved to teach at the Academy of Art in Berlin. Oban Bay (1889) was painted following another visit to Scotland, and shows the small bay beside the town of Oban, on the west coast of northern Scotland. This bay opens out to the Sound of Kerrera, and is now a busy ferry port serving the Western Isles; at this time it seems to have been but a small fishing port. The prominent building in the distance just to the left of the centre of the painting is Saint Columba’s Cathedral, the seat of the Roman Catholic Bishop for the Western Isles. The distant mountains are those of the Morvern Peninsula, on the opposite shore of Loch Linnhe. 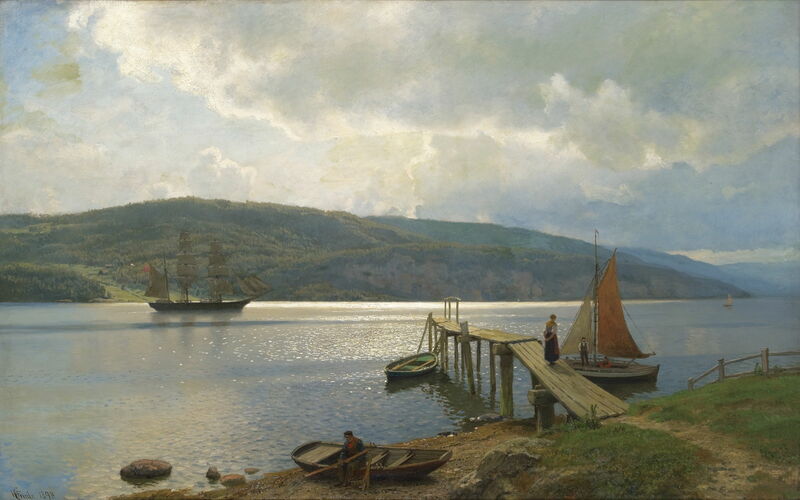 Hans Gude (1825–1903), Kaien på Feste i nær Moss (The Jetty at Feste near Moss) (1898), oil on canvas, 63 × 100 cm, Private collection. Wikimedia Commons. 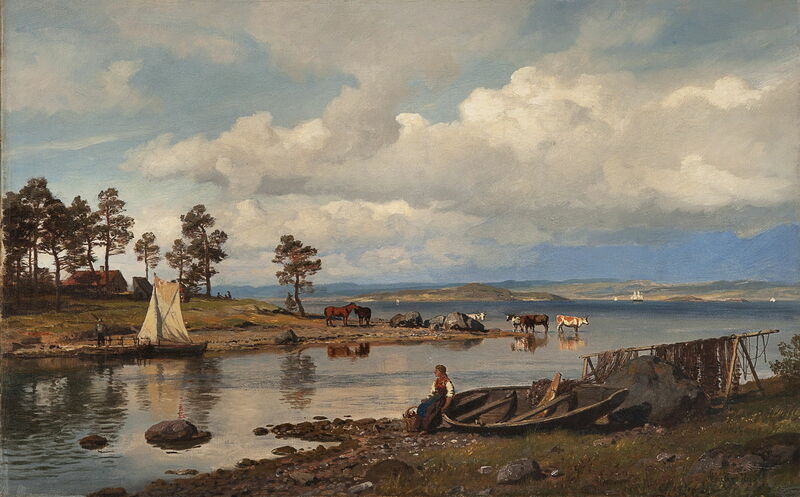 Kaien på Feste i nær Moss (The Jetty at Feste near Moss) (1898) shows another marine view in the far south-east of Norway, on the eastern side of the broad fjord which leads north to Oslo. Gude retired to Berlin in 1901, and died there in 1903, one of the founding fathers of Norwegian and Nordic landscape painting. Like other detailed realists of the nineteenth century, Gude’s paintings lack the distinctive ‘look’ of truly Pre-Raphaelite landscapes, but were far more practical to make, and more compatible with the business demands of the professional artist. They were rapidly being eclipsed in popularity by the Impressionist movement, and like all forms of representational painting were soon to be displaced by the modernism of the twentieth century. Posted in General, Painting and tagged Gude, landscape, Norway, painting, Peterssen, Pre-Raphaelite, Thaulow. Bookmark the permalink.